Actress Heart Evangelista and her boyfriend, Senator Francis "Chiz" Escudero, are now engaged after the lawmaker proposed marriage Saturday. Indonesian make-up artist Albert Kurniawan posted a photo on Instagram that shows Escudero kneeling on one knee while putting a ring on Evangelista's finger. The accompanying caption reads: "Congrats Heart and Chiz...yey.. they re engaged na :) #heartandchiz #heartevangelista @iamhearte @iamchize"
The actress appears tearing up during the engagement. 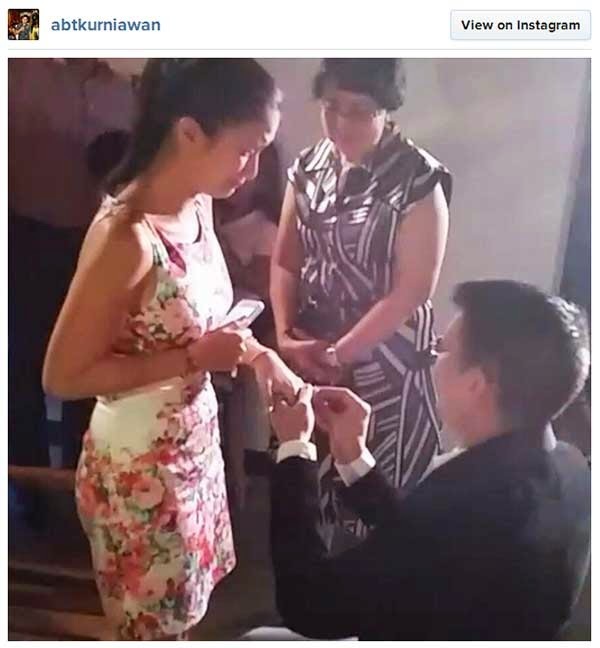 According to reports, the wedding proposal took place in Sorsogon where Escudero had served as congressman. It is also where the actress is currently spending a vacation. The senator separated with his ex-wife, Christine, in 2010. Their marriage was annuled two years later. Evangelista, on the other hand, broke up with model/football player and now PBB All In celebrity housemate Daniel Matsunaga in 2012. The couple's relationship has been going on for almost two years now. Details of their wedding are yet to be known.